Traveling brings out the worst in most people, and I totally get it -- the delays, the feeling of being herded, poked, and prodded like cattle, the variability in seat-mate(s). Traveling every week for the first 6 years of my career quickly afforded me a patient outlook though. Back then, I realized my scope of influence was limited to how I reacted/coped with those pesky delays, security procedures, or my seat-mate. As they say... sh-t happens, and it’s best to slap your headphones on and head to your happy place VS. getting chippy with everyone who frustrates you along the way. Ahhhhh -- the memories, though! That first year of traveling was brutal -- middle seat between booze-soaked business men at ORD, using my laptop sleeve as a pillow in ATL, choking on an apple and getting the Heimlich maneuver from an elderly woman en route to MCO. Oy vey. Fast forward to these days, and I’m traveling less. But, one thing I’ve noticed is that babies fly much more often. Maybe it’s always been like that, but I notice it more because I’m a mom. I’m traveling with Beckham yesterday and board the flight from Portland to Seattle (quick 40 min flight, thank God). In the hour leading up to the flight, he’s been running around, expending some energy, he’s eaten, he’s been changed. All is well, and I’m even patting myself on the back. 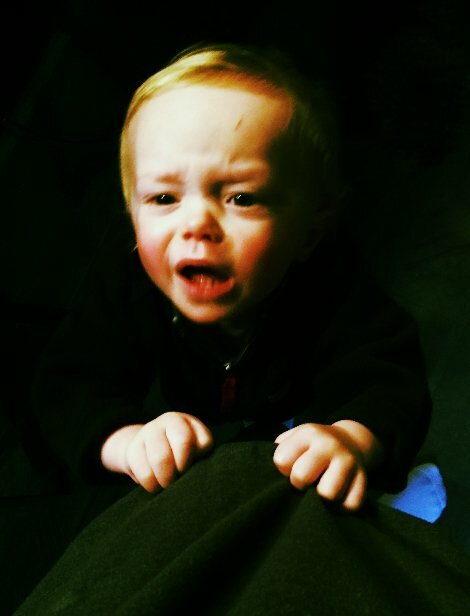 But then, as if he’s been bitten by a Walker, he has this EPIC meltdown screaming for daddy while we are walking down the aisle.Throwing himself on the floor of the plane, I’m now trying to bend down to pick him up while balancing his roller bag, my backpack and my diaper bag/purse ensemble. Right around row 12, it’s possible I hit someone in the shoulder, so I’m tossing out apologies, squatting/balancing baggage, and grabbing at air trying to scoop up his little arm to usher him down the aisle. Did I mention the plane was 500 degrees? I’m already sweating. By the time we get to row 19, Beckham is legit crying/gagging and swiping at my glasses and hair. He’s PISSED. For 10 minutes, I’m in the trenches. I tried FaceTiming Taylor so he could see daddy , ignoring him, distracting him, fanning his sweaty head and body, getting books/toys and snacks out and even scrolled through pictures of daddy on my phone. Nothing. If you saw someone struggling, sweating, close to tears trying to calm their toddler down, what would YOU do? If you were the woman in front of us in row 18, you thought launching passive aggressive chastising AND verbal assaults my way was the way to go. I honestly felt like I was the bearded lady caged up at the circus with an evil onlooker cackling at my expense, spitting on me and poking me with a stick, just to see if I’d react. Ugh!! As if she hadn’t witnessed my varied attempts and audible apologies to the folks from row 12-19, she seethed to her husband that I “didn’t even seem sorry” and that I should buy everyone’s drinks. She then commanded her husband to “wedge the in-flight magazine into the arm rest area just in case he barfs on me”. And as quickly as Beckham became frustrated, the woman in row 18 harrumphed and turned back around. PHEW. The plane’s air conditioning kicked on. PHEW. Beckham started waving at the lady sitting across from me as she reached over to squeeze my arm in support. PHEW. Then, like an angel floating down from the heavens, the flight attendant rolled through with a glass of Chardonnay compliments of the lady a few rows up.